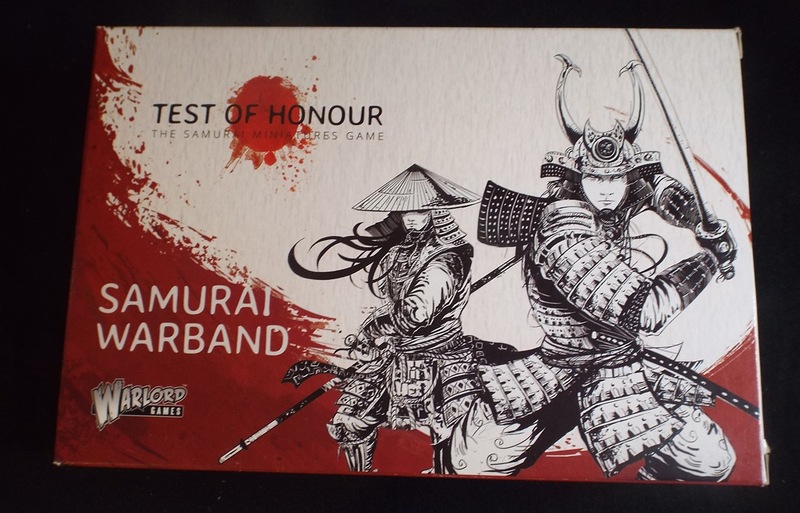 The Samuari Warband box set from Warlord Games is one of several expansions for Test of Honour. The assembly instruction leaflets (which are copies of those included in the main game) seem to have been put together by someone who has seen the model sprues, but doesn’t seem to have much idea about how the different parts were originally intended to be used with the models. As a result there are a number of issues with how models are constructed, including the now-infamous ‘heavy sword’ pose (Samurai incorrectly shown wielding a sword with a round bulb part way down the scabbard) Ashigaru being shown wearing two swords etc. Whoever produced these seemed more intent on showing how each modelling option and accessory could be used on the miniatures, rather than taking notice of whether they should or not. Moving onto the models themselves, whilst the sprues may give the impression that the models are multi-pose, this isn’t actually the case. There are only half a dozen poses available, plus some differences with leg or head swaps. This is especially apparent on the weapon options, as you actually need a pair of matched arms in order that certain poses work. However, these are not clearly labelled, so sorting out matching arms and weapons is a case of trial and error. Miniature construction is very fiddly, with only small areas to apply glue. Couple this with the previous difficulties in matching arms and weapons, and the whole construction process becomes long-winded and frustrating. Certain extras, such as Sashimonos, do not seem to have any locations on the model backs, and so in attaching them, the modeller has to take the ‘glue and hope it sticks’ approach, unless you want to spend extra time with a pin vice drilling location holes. I assembled Ashigaru armed with Teppo, and these suffer from a couple of issues – the posses seem somewhat stiff, there are only three pairs of arms that allow the figure to be seen aiming the weapon to fire, and actually there are only four teppo on the final sprue (indeed, there are also only four bow arms), so you cannot arm all five of your Ashigaru missile troops with the same weapon. Assembling the Samurai also suffers from the same issues of arm pose, which can result in model poses looking unnatural, simply because they were the only options that seem to fit. The sprues also seem to be missing pieces – for example, though five samurai can be built from the sprue, there only appears to be a single pair of Sode on the sprue (these are the large shoulder armour plates) – although attempting to fit these onto the available poses in a way that looks natural is again somewhat problematic. The final problem is one of the level and depth of detail. The entire pack suffers from soft/shallow detail, except perhaps on the armour plates. It’s especially apparent on items such as the teppo and the heads of the models. With the vast majority of models – even other plastics – the detail on the faces are deep enough that a base coat and ink wash provide a decent enough finish, but the detailing on the faces of these miniatures seems to be insufficient for this technique to work. Given all the issues with lack of detail relief, I found the models hard work to paint. Though the final result I achieved was OK, I felt that it took an inordinate amount of time and effort to get there – especially considering the actual quality of the models. Whilst some would point to the number of options provided by the box set – the ability to build figures representing Ashigaru Ko Gashira (officers) standard bearers or muscicians (both drum and conch shell) as well as rank and file troops, I am not convinced that this alone makes up for the shortcomings on the final product. And then there is the cost to consider. This box set is priced at £20 for 20 models. When you consider that for an outlay of an extra £1 or so, you can purchase 18 finely detailed metal miniatures from the Perry Miniatures Samurai range, I find it difficult to make any other recommendation than to avoid this box set completely, save yourself time and frustration on plastic model construction, and end up with a much better final product. I have the starter box and I haven’t even touched the figures due to the challenges of the build. I have decided to go straight to the Perry range. Which does raise the question with the expansions. Do the cards included add to the game at all? From your review of the Samurai warband, the cards are just the stat cards in a different colour correct? I will be writing in-depth reviews of all the expansion boxes. Of them all, this one is definitely the worst, as all it effectively does is add a third colour of Warband cards. Bit late to this review…… In regards this box set I would agree that the miniatures are not great. The game is, but these miniatures no. Thankfully the metal miniatures, Warlord Games are selling, are really nice. I just have one question in regards the Ashigaru and swords. I have built mine with some carrying two swords, and others with only one. I have seen some prints online which depict Ashigaru with two swords. I am assuming that it was not common practice but did occur. Reading the review I get the impression that you are saying two swords is just wrong. Was the practice of Ashigaru carrying two swords officially forbidden?